– or the place of absolute stoke. I was absolutely stoked by the people, the place, the beaches, the water, the animals, the landscape, the weather, the food. And the SURF!!! I spent almost 3 weeks on the North Shore of Oahu, which is also called the “7 mile miracle” amongst surfers. Why it is called this – once you have been there the answer is obvious: it’s one single 7 mile long shoreline with some of the best surfbreaks in the world just lining up one after the other. It’s home to THE best surfer in the world (not only in my personal opinion, but voted Number 1 by the surf community all over the world) – John John Florence. 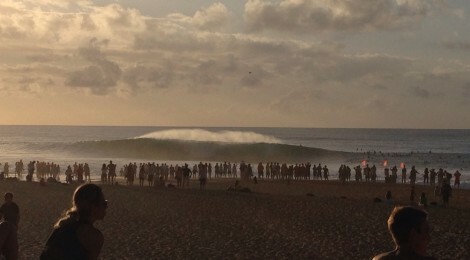 And it’s the stage of the most prestigious surf competition on the World Championship Tour – the Billabong Pipemasters. And even though the contest suffered from bad to medium swell conditions on many days so it couldn’t be run, I got to see the best surfers in the world take on the heaviest waves I had ever seen in my life once the contest was on. I got to see my favorite surfers from very close and even managed to take pictures with some of them. Even now, almost 3 weeks after I left the island, thinking of it I have a broad smile on my face and shivers running down my spine. It was breathtakingly beautiful, exciting, inspiring, fear-inducing – in one word: unbelievable. But of course I not only sat at the beach and watched the surf competition. I also went surfing myself (when it was so small that the contest was called off), I went on hikes and I traveled to Honolulu and did some sightseeing there. Most importantly though, I got to meet a bunch of really great people and was lucky to share these amazing days and most memorable moments with them. Starting with Bernie and Maria, my hosts, who picked me up in the middle of the night in the middle of nowhere as I had missed the last bus to the North Shore. On to Gabriel Medina who pretty much would have walked over my towel on his way down to the water in his first heat had I not picked it up, to Kelly Slater who, obviously very relieved, walked straight at me after he had won his 2nd heat, to a picture with Carissa Moore, who is an inspiration to all female surfers and has such a great character. 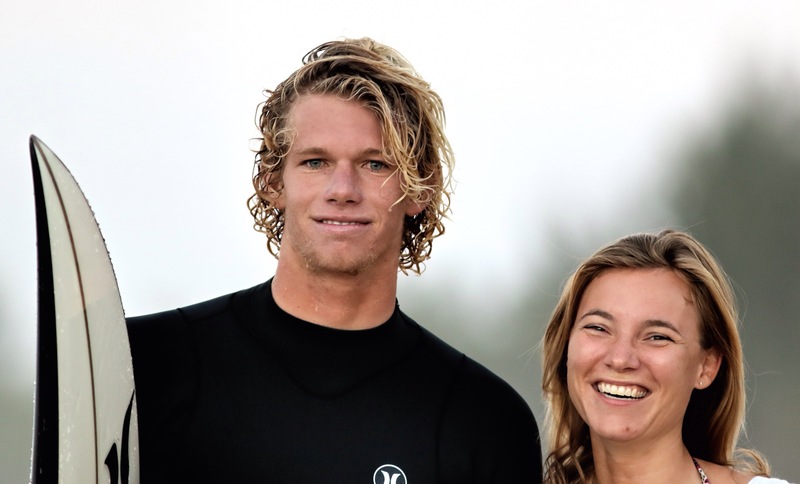 To a lot of other great surfers who gave their best in and out of the competitions. On to fun dance parties at Surfer [the bar], from where I drove 13 people of our hostel home in a regular van and to which we kept coming back for interesting podium interviews with the local shorebreak photographer Clark Little, concerts by reggae and rock artists, an open-air viewing of the “Thundercloud” surf documentary, and the big party on Finals day, with a shitfaced Mick Fanning (former world champion) next to us on the dance floor and the most humble and sober winner of the Billabong Pipemasters and Vans Triple Crown 2014 Julian Wilson outside the front door. On to great hikes with my friends Laurence, Alec and Mattias, on which we got to stand high above the North Shore and look along the western and northern coast lines, got to see albatrosses nesting and monk seals resting at Kaena Point, and watched the big wave of Waimea not being big at all. With which I took amazing pictures and had a lot of fun watching surfers do their crazy airs and drops. To Hannah, with which I shared the explosive moment of joy when Julian Wilson won the final against Gabriel Medina!!!! On to the “honu” – the Hawaiian sea turtles, which I saw pretty much every time I stepped into the water on Hawaii. Surfing the reef on Alii Beach in Haleiwa and being visited by a turtle there, just popping its head out a couple of times, was certainly one of my most touching experiences on Hawaii. And considering my close and intimate encounter with the nesting turtle in Nicaragua, by now I am convinced that turtles, gliding so gracefully through the ocean and yet being so clumsy on land, are my “aumakua”, my protection spirit. On to the final day on the North Shore, on which I got to see Pipe going off in front of an amazing sunset and being surfed by Kelly Slater, Jamie O’Brian and John John Florence, who after a great freesurf session blessed my time on Oahu with a picture of the two of us. Oahu could not have been better and I will carry this positive energy with me forever. I call it the North Shore Stoke.